The iPhone continues to be an AT&T exclusive in the US. With the iOS 4 upgrades the iPhone 4 supports tethering over Bluetooth or USB. The feature is an extra $20 per month on top of your existing iPhone data plan and it also deducts bandwidth from the 2GB you get with the data plan. It's not a coincidence that AT&T timed the release of its iPhone tethering option with the move away from unlimited data plans. You don't have to give up your existing unlimited data plan if you don't want to, however if you want to enable tethering you have to sign up for the new $25/2GB plan. I'm not a huge fan of iPhone tethering right now because despite paying for the service and having full signal strength on AT&T, I'm getting horrible transfer rates while trying to upload this article. I had to sign up for airport WiFi to get it live, thanks AT&T. When it does work however, it works well. As you'll see later you can easily get multiple Mbps out of AT&T's network in areas with good coverage. That easily equals the lower end of what you'd see from WiMAX today. As I've mentioned before however, it's really hit or miss with AT&T. The network is either great or totally unusable, while its competitors are generally more consistent but never quite as fast. I'd say that there's a good chance Apple will bring the iPhone to Verizon, it's just a matter of when. AT&T's plans are actually reasonably priced if you don't go over the data limits. A $15/mo data plan will get you 200MB of transfers per month and $25 will give you 2GB. For users like my parents the 200MB option is great. Even for me personally, 2GB is fine. I tend to peak at 700MB per month, but that's because at the office I'm almost always on my desktop or connected via WiFi. It's unclear how tethering is going to change this for me. Our own Brian Klug on the other hand easily pushes more than 2GB of transfers per month. So AT&T's rate switch is either going to save you a few bucks per month or make you really unhappy. 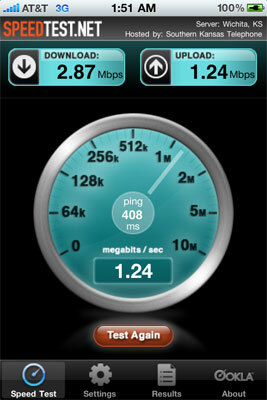 The iPhone 4 brings HSUPA class 6 for upload speeds of up to 5.76 megabits/s to the platform. This is a 15 fold improvement over the 384 kilobits/s maximum of the iPhone 3G and 3GS, which I routinely see. Not all AT&T markets are updated to HSUPA, and in practice I saw uploads of around 1.5 megabits/s, in line with class 2 or class 3 HSUPA. Downstream HSDPA speeds remain unchanged from the 3GS, supporting up to 7.2 megabit/s HSDPA. I'm lucky since my market is HSDPA 7.2, as I routinely see speedtests of 5 megabits/s or above very late at night when there isn't very much plant load. I haven't seen any measurable increase in speeds over the 3GS, except in locations with very low signal as noted before. Even Anand in one of the slowest 3G cities in the US saw significant improvements with the iPhone 4. AT&T's network in general seems to be improving. While the best he'd been able to achieve was around 1Mbps a year ago, these days he can break 2.5Mbps down during the evenings. WiFi speeds have also improved, as Apple has added 802.11n in the 2.4 GHz band. 5 GHz support remains absent, something which would have likely complicated antenna design even further. Interestingly enough, the BCM4329 WiFi and Bluetooth SoC does contain 802.11a 5 GHz support, the reason it's disabled is again likely due to antenna design constraints. The Broadcom SoC also includes an FM tuner and transmitter, though support for either remains and sadly (given Apple's historical lack of FM radio support) will remain such. Bluetooth 2.1 EDR is there as well. The iPhone 4 seems to connect at 802.11n rates of 72 megabits/s in best case, far from the maximum without channel bonding of 150 megabits/s. This is still a welcome improvement from the 802.11b/g in the iPhone 3GS, which seemed to never connect above b rates in practice. As an aside, mobile devices using 802.11b rates (modulated using DSSS) are a huge contributing factor to WiFi congestion at conferences - I've even seen DSSS modulated rates (and thus 802.11b devices) explicitly disallowed from connecting to APs at conferences. It's a welcome improvement to see iPhone bringing N support. However, even on my 25/4 DOCSIS 3 cable connection, I could only squeeze out a maximum of 8.5 megabits/s down and 8.0 megabits/s up while connected at 72 megabits/s best case. This was using the speedtest.net app to a local test location. I tried with an Airport Extreme (new generation), a WRT600N running DD-WRT, and a WRT54GL-TM running Tomato. All three showed similar results capping out around 8 megabits/s down when I could run tests in excess of 30 megabits down on my desktop. This is probably more of a CPU bottleneck appearing than anything else. Early today, the folks at DigitalSociety also managed to get much faster WiFi speeds in the neighborhood of 20 megabits/s, way higher than my meager 8 megabits/s. To do so, they loaded an MP3 in safari stored on a local webserver and watched network utilization. I wish I had thought of this, because it's perfect. In the past, the speedtest.net app always used to saturate my connection over WiFi. My only explanation is that the application performs slower over WiFi in iOS 4 than it did in iOS 3, something Anand noted as well. Thanks for all the heads up messages, everyone! I set up a similar test to DigitalSociety's. I opened an 85 MB PDF stored on my local web server in the browser of each device and watched network utilization using bwm-ng. I tested with an Airport Extreme connected over gigabit to my webserver with no other network utilization. I took the average of 5 runs on the iPad, iPhone 4, iPhone 3GS, and my AT&T Nexus One running Froyo 2.2 (which is 802.11n). The results are much, much more in line with earlier expectations. 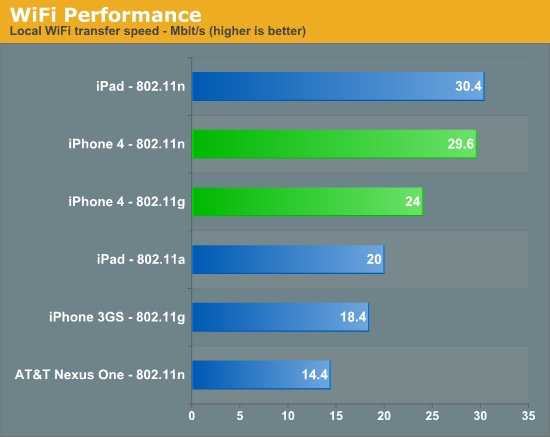 The iPhone 4 comes close to but can't quite best the iPad, though the difference is minimal. I did notice that the iPad associates at the same 72 megabits/s connection speed as the iPhone 4. Thankfully, the iPhone 4 easily bests the iPhone 3GS. Finally, although the AT&T Nexus One associates at an 802.11n rate of 65 megabits/s, it's slower than the iPhone 3GS. I have a feeling the device is writing the PDF into flash, whereas the iOS devices are loading it into memory. Sorry, I think that is a bad comparison. Sweden is 2/3rd the size of the province of Saskatchewan and 9 times the population of Saskatchewan as well. You can't even compare Sweden to the province of Saskatchewan let alone Canada. You have roughly 13.5 times the population density of that province. Mind you this is probably least densely populated of the provinces (not territories) Maybe not the best example, but lets look at a better one. According to the CIA world factbook (yes, I use a foreign agency's site for info on my own country), 90% of Canada's population lives within 160km of the US border. If we make an estimated measurement and take the southern border's length at 6416 km, multiply that by 160 and you get an area of about a million square kilometres with a population of, adjusting for the 90%, about 31 million. That would be an actual density in that region of about 31 people per square kilometre. "It's pretty amazing if you're suggesting that you can now get voice and data for just $10 a month. " You rarely get pre-paid minutes here unless you really want to. You just pay about $6 a month and get billed for your minutes afterwards. In my case, it's about 10¢ per minute, but to phones on the same network, you get unlimited texts, mms's and minutes. Yes, for $6 a month. That includes most of my friends and relatives that's pretty much what I pay for voice and texts. Then on top of that, you can add your data plan, for example 1GB a month at 6Mb is $9 (add $7.8 for 5GB at 10Mb/s). -Or, if you really must go crazy, you can get 3,000 minutes for $65. Combined with 5GB/month at 10Mb/s, you're paying roughly $82. That's the absolute maximum. No subsidized phone, but you get over 3x more minutes than the iPhone deal and 2.5x the amount of data. The phones aren't really subsidized at all when you look at the total cost. "You could maybe compare to Ontario (our most populated province) however, you are less than half their size with 80% of their population. When calculated out you still have almost twice the population density of our most populated province. "